A-Frame: what you see is what you get. Like a culinary School of Athens, Chef Roy Choi (Kogi and Chego) continues to philosophize and ponder the question: What is good food really about? His latest attempts at answering this inquiry can be found copiously plated at the A-Frame Restaurant in Culver City, CA. Teaming up with restaurateur David Reiss (The Brig and Alibi Room), Roy Choi has designed a menu that not only satisfies an eater's basic hunger but also celebrates Los Angeles' culinary diversity without pretension. IHOT: International House of Tasty! As if reinterpreting Abraham Maslow's hierarchy of needs, Roy Choi and David Reiss have elected to strip down the unchallenged conventions of dining by focusing on unique flavor combinations and fun yet fulfilling food while, in their vision, removing the unnecessary. 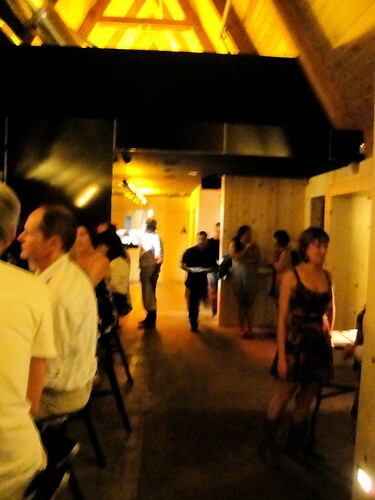 They've achieved this by taking away utensils and literally sanding down any distractions from the dining experience. 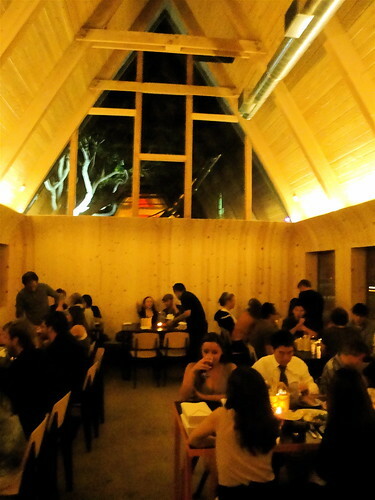 The spartan interior of the A-Frame has been pared away leaving its essences of wood and frame, the wood smoothed to its pristine state with the sole purpose of highlighting the main subject — the food. Reminiscent of a topsy-turvy boat's hull or, as Roy Choi describes it, the underside of a skateboard ramp, A-Frame mostly conjures up cozy memories of IHOP meals with endless pitchers of coffee and more flavors of pancake syrup than most people know what to do with — that's because the distinct building used to be an IHOP — but, after one bite of A-Frame food, any nostalgia linked to the International House of Pancakes will be quickly replaced with A-Frame's international house of flavors, since all tastes, from Peru to Okinawa and from the sweet South to ono Hawaii, are deliciously represented in the offerings. No DJ necessary with this par-tay mix, yo! 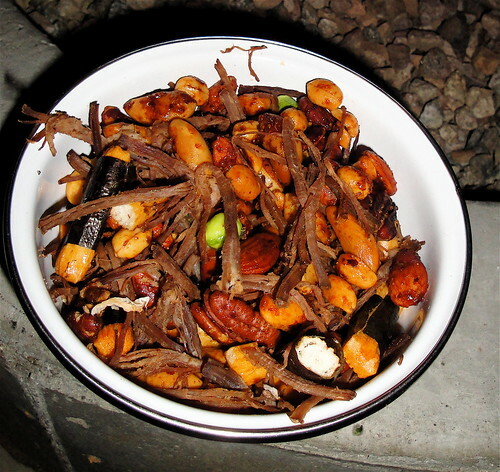 Snackish items like the Spiced Sugar Nuts is a superior version of a Chex Party Mix with a roasted miscellany of nuts, spritely Japanese rice crackers wrapped with nori, roasted peas and, my childhood favorite, hand-shredded strips of moist and fruity Chinese beef jerky. Without a doubt, A-Frame's consumption of Hite Beer increases dramatically when these enormous snack bowls hit tables. When the Baby Back Ribs get delivered, heed this: do not share! They're too tasty. These ribs are a gateway drug to turning into a competitive eater specializing in these particular ribs. 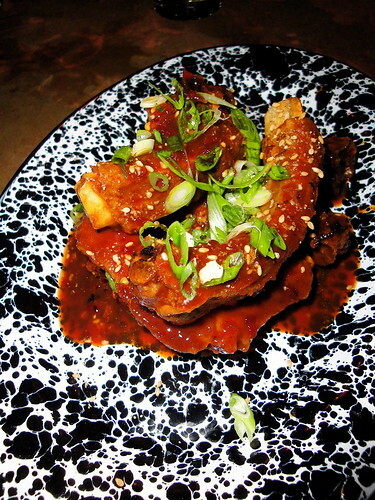 The hoisin-chili glaze and Chinese spices sweetly permeate throughout the succulent porky flesh, while the masterful cooking leaves a crust so crispy and satisfying, the rib croons as it crackles. The Carne Asada Torta isn't your average torta. It's a grand steak sandwich that quells any size hunger with a submission hold that will make a mixed martial artist weep like a 4 year-old girl whose goldfish just went nappy-nap — forever. The hefty skirt steak, grilled to an ideal tenderness, yields to each bite thereby leaving the massive torta intact and ready for another go. Pickled red onion, cilantro, queso fresco, salsa roja are layered thick and scattered within an airy roll so large, you might want the fire marshal to examine the maximum capacity of your stomach before you have another chomp. 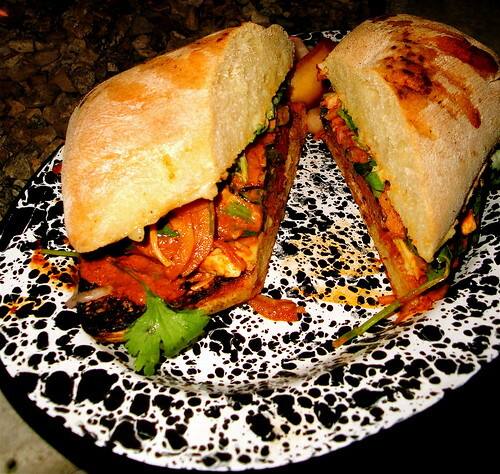 The juices, char and essences of everything between the bread all get sopped up into the crevices like a savory sponge. 28 hours in a beer brine, 4 hours to drip dry, 4 hours cooked on a rotisserie, flash cooled to slightly below room temp and finally fried, the Cracklin "Beer Can" Chicken is one frickin' epic chicken. Mimicking the process of creating the legendary Peking duck, Roy Choi fashioned his signature style of cooking the famous water fowl by subbing chicken as well as borrowing Peruvian flavors along with the Chinese ones. The ultimate result of over 30 hours of prepping and cooking is a chicken skin so crispy, the texture matches that of a stack of roasted nori sheets — shatteringly crisp, as they say. Once you pierce skin, the juices from the chicken gush into your mouth and trickle down your cheeks, the meat is dream tender. 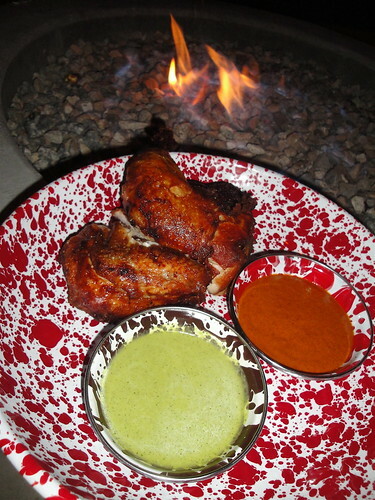 The chicken's flavor is distinctly of Chinese 5 spice, but the accompanying sauces are a soothing salsa verde with avocado and lime and a spicy-smokey salsa roja. Even with the latin influences, it's still about yin and yang. As a bonus, Roy includes with the chicken his own brand of the century egg (the infamous Chinese preserved egg also called the Thousand-Year Old Egg). Sadly, because my stomach is not designed like a bovine, I couldn't go on to sample the other hard to resist plates like, Blue Crab Cakes with ginger lemongrass creme fraiche, Korean BBQ Lamb Chops, Green Curry Clam Chowder and so many others. Chef Roy Choi (who designed the A-Frame menu) along with Chef Jonas Curameng (who executes the menu) are both on sort of a culinary spiritual journey and will try to convert anyone open to their message. I've tasted the message and it's a very delicious one. Although their brand of spirituality has a high calorie count, it's worth every one because even enlightenment has a price. 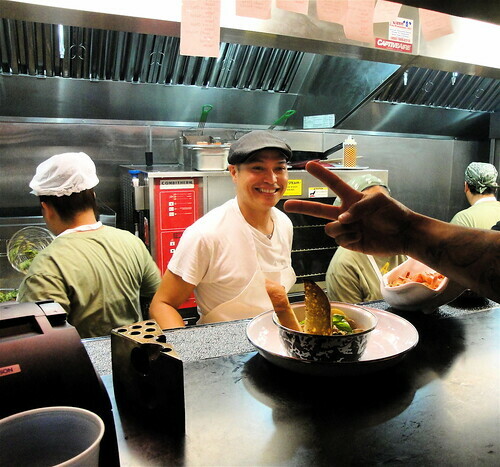 Chef Jonas Curameng, self-described Padawan to Chef Roy Choi. View the full A-Frame experience in larger than life HD!! Below. A-Frame Restaurant from Eddie Lin on Vimeo. I loved it. Great vibe. 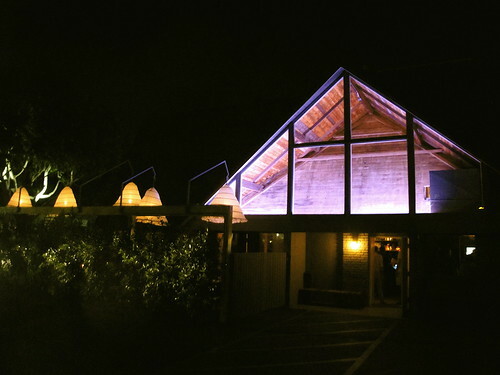 Ricci, yes, great vibe & great grub at A-Frame. Anony, thank you! More good stuff coming soon!! I can't believe no mention about their crazy Blazin J's kettle corn, corn pops, furikake mixture...it was outstanding. The chicken did take the trophy though, very crispy and tasty indeed! Didn't have the pleasure of tasting the Furikake Kettle Corn, but everyone else seemed to be raving about it. Next time. There is always a next time.